We do unity game / application development for various platforms including iPhone / iPad, Android, Play-station, XBOX & PC. 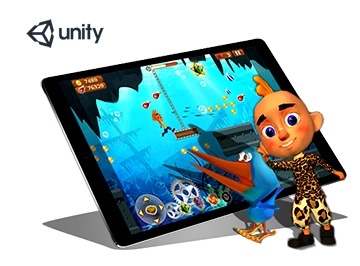 Unity is a multipurpose, cross-platform game engine that is ideal for the development of cross platform 3D games, supports 2D and 3D graphics and simulations for computers, consoles, mobile devices. With unity 3d tool we can develop games and apps with high-quality graphics and engaging features. Unity 3D tool has features such as visual editor, multi-platform game build support, full and robust scripting and animation system to provide robust development for high-quality games and apps. Our skilled developers can work on this tool and reduce the time-frame of the development cycle and help plan for rapid releases. By using this cutting edge tool we deliver your content to virtually any media or device. We can work on Augmented reality AR, virtual reality VR and Mixed reality MR HoloLens projects and multiple platforms developments like Android, iPhone IOS, windows PC, Apple Mac PC, Linux, Facebook applications/Games, Xbox, Play station PS etc. We turn boring training into an interactive session. We develop full 3D simulation,3D Architectural Rendering, Animation, Exterior, Interior, Floor Planning and Video Production of a building. To build comprehensive, thoughtful and purpose-driven solutions that are tailored to meet your business objectives get in touch with us if you are looking for something similar.